During the peak season, the island is flooded with tourists so finding hidden gems in Koh Samui can be difficult. I’ve spent 10 days on this beautiful island in search of remote, hidden places and I’m gonna share my favorites with you. An amazing natural wonder, the Overlap Stone is well hidden in the Koh Samui jungle. A big, round stone sits in an incredible balance on another massive stone, overlooking the Lamai Beach. This place is great to admire the views and reconnect with nature. Most of the time it’s empty, with no trace of tourists. I believe that the Overlap Stone is still an underrated tourist attraction in Koh Samui. Getting to it can be challenging since Google Maps won’t help very much. Check out my full guide for all the information you need about this amazing place. If you are looking for an unusual experience, this is the place to go. Although Wat Khunaram Temple is an important religious place for the local people, you won’t find that many tourists here. This temple is starting to gain popularity due to the Mummified Monk which is on display in a meditation position. Although for some it can be a chilling experience, it’s a great way to learn more about the Thai culture. Check out the top 3 temples you must visit in Koh Samui. The Elephant Rock is a unique rock formation located between Chaweng Beach and Silver Beach. Although the rock does not resemble an elephant, locals named it the Elephant Rock due to its size. If you’re up for a hike, you can climb on top of the rock and enjoy an amazing panorama. Another Koh Samui hidden gem is the Silver Beach which, in my opinion, is the most beautiful beach on the island. Here you can find incredible water surrounded by huge rocks. Apart from the beautiful views, you can also snorkel and play with hundreds of colorful fish. Silver Beach is not yet very popular among tourists due to its location outside of the touristy area but it’s definitely worth visiting! Read more about Silver Beach here. Get up early, head to the top of Na Muang Waterfall 2 and enjoy the natural pools overlooking the jungle. This waterfall is probably the most beautiful on the island and it offers some incredible views if you are brave enough to climb to the top. Getting to is a bit difficult (Google Maps will take you to the wrong place), so make sure to check out this complete guide. Leam Yai Beach is a remote, unspoiled beach and one of the best kept secrets of Koh Samui. Located on the western coast of the island, this place is great if you are looking for a quiet place where you can relax and reconnect with nature. Most of the time there’s nobody on the beach, so you’ll have it just for yourself. For more amazing secret beaches in Koh Samui, click here. Although this is quite a popular location among tourists, you can always explore more if you choose to get off the main street. You’ll find streets with boutique shops, cute cafes and restaurants. 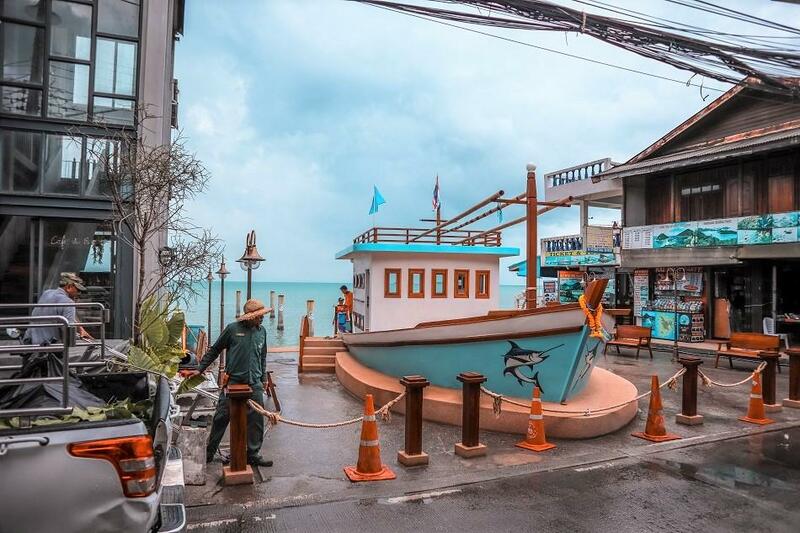 Check out my complete guide to Bophut Fisherman’s Village. Probably the most beautiful temple in Koh Samui, Wat Plai Laem Temple impresses through bright colors and incredible details. The centerpiece of this temple is the amazing 18-arm Guanyin statue. To read about the top photography spots in Koh Samui, click here. These Koh Samui hidden gems have not yet been invaded by tourists. If you konw other hidden places in Koh Samui, let me know in the comments section.